I had a great time this week at the Tall Ships Philadelphia and Camden festival. I went to the Parade of Sail on Thursday and back the next day to go aboard some of the ships. It was hot and sometimes rainy and occasionally not optimally organized, but my lucky ship karma came through in a couple of instances, making it an overall positive experience. The Marquis de Lafayette is one of my historical boyfriends. I had already taken a “staycation” week, planning to laze by the pool on the longest days of the year, and the festival fortunately fell during that week, so all I had to do was get a ticket. The weather was iffy for the Parade of Sail on Thursday afternoon, so I wasn’t sure if I was going to go, but at the last minute the weather people said the rain would hold off till the evening, so I decided to go. My first impression of the event was not great. Buying a ticket online in advance was very easy, and the multiple day pass a good deal–less than tickets for two days would cost, and I was pretty sure I would be going on at least two days. I joined the entrance line about a half-hour before the Parade of Sail was supposed to start. The line was not moving, and eventually a Line Dude came down and said that anyone buying a ticket could walk right in, but those of us who had purchased tickets in advance had to wait. I pointed out that made no sense, and he rolled his eyes and said “Somebody doesn’t know what they’re doing.” Apparently there were problems with the device scanning the ticket barcodes. Well, that’s just peachy. I was concerned about missing the parade of sail, but eventually everything was straightened out and I got in. I went down along the riverfront to what seemed to be a good place to view the parade, in front of the Hilton and next to the Seaport Museum. I was kind of hoping someone would announce the names of the ships as they went by, but that didn’t happen. I called out, “Good day, Dr. Franklin,” and he waved and called out, “Good day,” but looked a bit hot and cranky. I was also hot and cranky and didn’t blame him a bit. It was warm and sunny, and I prepared with lots of sunscreen and a big hat. I also brought a bottle of water, finding out only later you weren’t supposed to bring in bottles, but nobody said anything (my bag was inspected on the way in). I sat on the hot stone bulkhead by the river, and at one point one of the Ben Franklin impersonators (there are several) walked past. I called out, “Good day, Dr. Franklin,” and he waved and called out, “Good day,” but looked a bit hot and cranky. I was also hot and cranky and didn’t blame him a bit. One of the big hypes of the event was that the World’s Largest Rubber Duck was going to be part of it. In retrospect that was a huge mistake because she had a gash in her side and wasn’t able to be inflated for most of the Festival. She sort of limped up the river, listing a bit, at the end of the parade, but an awful lot of people, especially those with kids, were complaining about no duck. Everyone also complained about the crowds on the weekend…perhaps with no duck, most of the crowds would have stayed away, and those of us who actually care about the ships would have had less waiting time. I wasn’t there to see the duck, but felt some disappointment because the larger ships, except the Picton Castle, didn’t come up under sail. Several of the smaller tallships were under sail–it’s always nice to see! Most of the promised ships had come up the river, and the duck could be seen down under the Walt Whitman bridge, but was not coming any closer. A lot of people were going away, disappointed and sunburnt and sweating. It started to cloud up, and the stone bulkhead was no longer too hot to sit upon, so I swung my legs over, letting them dangle over the water, and waited for the lady I’d come to see. Finally, we could see L’Hermione pass under the bridge, with the Barque Eagle, the Coast Guard sail training vessel (which we missed the opportunity to go aboard when we toured the Coast Guard Academy in 2010, so I was excited to have the opportunity to go aboard), came up closer to the Philadelphia side. At one point L’Hermione fired a broadside, and I grabbed a bit of video. As L’Hermione came closer, volunteers began to clear people who were sitting on the section of the bulkhead to my right. They said the ship would be mooring there and it was not safe to stay (of course). I was thrilled, though–she was going to be RIGHT HERE NEXT TO ME! Once again my Happy Ship Karma came through! I took some photos as she arrived, which my Googley Overlords obligingly Gif’ed for me. She got closer (and closer and closer) and it soon became obvious that my great seat was no longer a safe one. I scrambled off the bulkhead, but the fascinated crowd pressed closer and closer as the ship was gently nudged into place by a tugboat and moored to the bulkhead. There were no more comments about the missing duck. Several of us sang La Marseillaise (well, I sang as much as I knew of it, which isn’t a lot). Imagine a press of people, volunteers, media, hands held high with cameras and cellphones, trying to capture this exciting moment. It must have been like this on the Delaware docks in the 18th century as the crowd pressed close to see what interesting stuff this new ship has brought from other lands. Finally, I turned away, and standing behind me was Benjamin Franklin (well, the impersonator), staring thoughtfully up at L’Hermione, which struck me as just right. The line to get aboard L’Hermione was obviously going to be very long, and several of the other ships I wanted to go aboard were not open, and it was starting to rain a bit, so I decided to come back on Friday and go aboard the ships I wanted to see, especially L’Hermione. 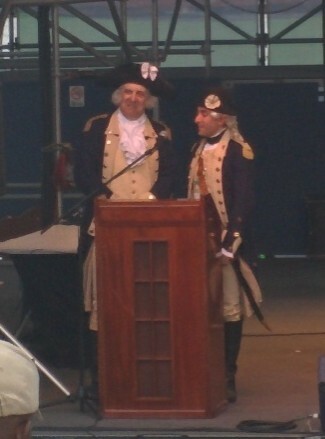 However, there was an announcement that the opening ceremonies were going to take place, featuring George Washington (!) and the Marquis de Lafayette (!!). Well, I couldn’t pass that up, now could I? I made my way to the main stage. And there they were: General Washington and M. le Marquis, introducing the other honored guests, and generally having a lot of fun. The Marquis seemed eager to explain how he had helped the American cause in the Revolution, and the General wanted to lead cheers (hip, hip, huzza!). They were a lot of fun and should take their act on the road for the entertainment of history geeks. A young lady was introduced and began to sing the national anthem. We all naturally scrambled to our feet. She finished, there was applause, everyone went to sit down, and she broke into La Marseillaise, and we all stood again, and some of us even sang along. There was a lot of cheering (some French folks from the Hermione group were there), and the young lady didn’t sit down, so we all waited. Yes! O Canada, half in French and half in English; another pause, and she broke into a song I didn’t recognize in a language I don’t know, but I guessed it was the Portuguese national anthem. The Sagres, the Portuguese sail training vessel (nearly identical to the Eagle) was moored just behind the stage, and all the young sailors snapped to attention, so I think it’s safe to say my guess was correct. They all clapped enthusiastically when she was finished. As one of the speakers said, “You know it’s going to be some ballgame when it starts with four national anthems.” And it was an impressive accomplishment! I wish I knew the young lady’s name. There was some speechifying, and more amusing commentary and introduction and huzza-ing by the General and the Marquis, and it started to rain, so I decided it was time to go home. Then I saw Washington and Lafayette at the side of the stage, and couldn’t resist going down to snap a photo. I sidled up to the Marquis and said, “I live in Lafayette Hill, Pennsylvania.” His face lit up, and he said, “That’s where the Battle of Barren Hill took place!” So he was very well prepared to play his part. 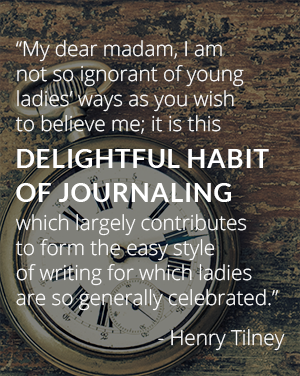 Well done, Monsieur! I arrived the next day early in the afternoon (hey, I was on vacation), entered with no problem (they were no longer bothering with the scanner) and made my way down to where L’Hermione was moored. There was a terrible line that wound back on itself. I figured it would take at least a couple of hours, and took my place and prepared to wait. I was surprised that the line didn’t seem to move; were people not coming OFF the ship? Someone asked me if this was the line for the ferry. I said, “No, it’s the line for the Hermione.” Someone else said, “No, it’s the line for the ferry.” We applied to a security guard, who confirmed it was the line for the ferry, and told me where to wait in the (very much shorter) line for the Hermione! Yay! Thirty minutes later, I was aboard. Honestly, the tour was kind of anticlimactic. Most of the ship was roped off, being crew quarters or places they just didn’t want the plebs to mess with (can’t blame them). But I got to stand on her deck and go all over and take some photos. (I posted a link to a photo album at the end of this post.) L’Hermione is beautiful and if she comes to your town, try to go see her. I promise it is worth it! I made my way to the other end of the line of moored boats to the Barque Eagle. There was almost no line there, even though it was free for all to go aboard–you didn’t have to have a ticket. That was appropriate, as (as the Coast Guard admiral who spoke at the opening ceremony pointed out) she is our tall ship as Americans. The taxpayers pay for her and she belongs to us. The Gazela, Philadelphia’s official tall ship, was also open to the public. The Eagle is big and beautiful and I enjoyed going all over her! Some of the mechanism was also roped off, which was understandable when I saw ignorant people letting their kids climb all over the wheel like they were monkeybars, and even adults who should know better pulling on the handles. I mean, fine, pose with the wheel, but don’t pull on it! However, the cadets didn’t seem upset about it, so perhaps I am overreacting. I then decided to try to get on the Sagres, the Portuguese sail training vessel. She is basically identical to the Eagle, as she was built at the same time by the same German shipbuilder. Both ships were seized by the U.S. after World War II. The Sagres was given to Brazil and then made over to Portugal (I’m not exactly sure how that happened, but I gathered that much from reading the material onboard). There was almost no line and hardly any wait to get aboard. It was interesting to see how the Portuguese have made the interior different from the U.S. The Sagres was…the only way I can put it was she was fancier. She had gilding where the Eagle didn’t. In particular I was amused by what were apparently gilded belaying pins. 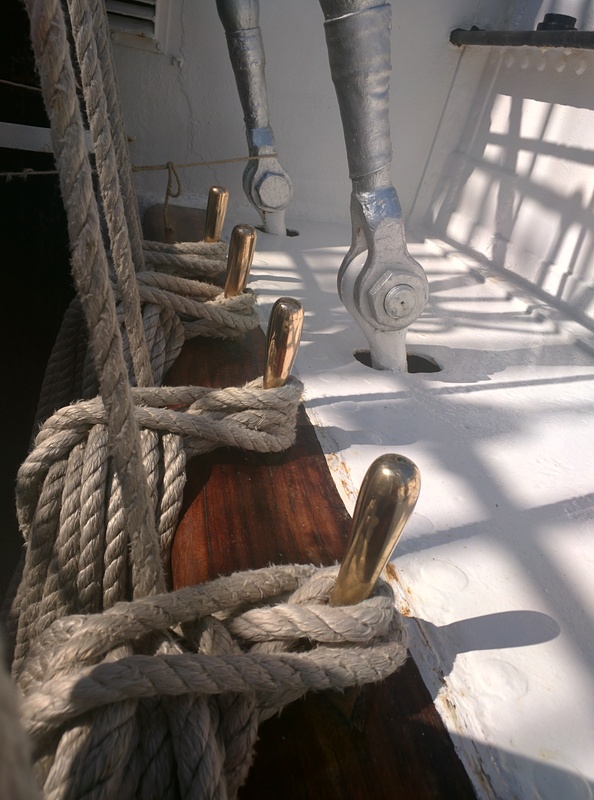 In the Hornblower fandom, belaying pins have a certain meaning: several times they are used to render characters unconscious, so we call them the Fangirl’s Friend. The Eagle was big and gorgeous and spotlessly clean, all the sails tied down severely, everything spit and polish, shipshape and Bristol fashion. She is beautiful. The Sagres was beautiful, too, in her way; also spotlessly clean, also shipshape, but with a bit of Latin romance to her. I loved them both and was so happy to go over them, and stand on their decks and catch the breeze off the river and watch the other ships passing by. After I saw the Sagres, I was sated with ships and ready to go home, hot and sticky, and have a quick swim. A very good two days, and a very good vacation.